“I have very expensive tights and I demand that they be respected!” – Wolfgang Amadeus Schmutzenberry. The beautiful Oprheum Theater in downtown Champaign was elegantly set with black tablecloths, candles at every table, and a temporary stage at the front — set for a nice, pleasant afternoon of … roaring laughter from children. “Pondering Pulses” turned out to be a wonderfully funny, engaging, and educational experience for kids and adults alike. Rami Vamos was hilariously funny as he delivered his lines as the clumsy, but passionate Wolfgang Amadeus Schmutzenberry. Natalie Ellis, as a doctor(ate) (student), complimented Vamos, as she and the Anasazi quartet worked together to find a cure for Schmutzenberry’s lack of (musical) pulse. Schmutzenberry, a musical “geen yus,” had set his mind to writing his first symphony, but was unable to get past the first note. Ellis was quickly able to determine that he had a “tempo-ture” and needed immediate help. 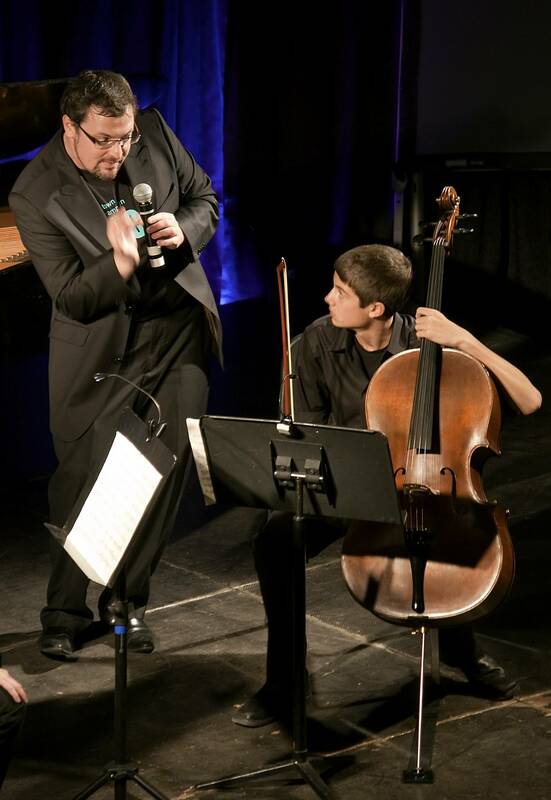 Throughout the course of the performance, the audience and Schmutzenberry learned terms, such as tempo (which is not to be confused with tempura shrimp), presto, pulse, and rhythm in easy to learn language for both kids and non-musically trained adults. The audience was invited to participate by clapping along and using arm movements to help Wolfgang find his pulse. I had never been inside the Orpheum Children’s Science Museum prior to last Tuesday evening, when I attended the final performance of the DoCha Chamber Music Festival, and what I found was pleasantly surprising. In the lobby of the museum, there were bottles of wine being sold for seven dollars, gourmet baked goods provided by Pekara Bakery and Bistro, and even DoCha t-shirts on sale just outside the theater doors. And while the set-up in the lobby was classy and impressive, the inside of the theater exceeded my expectations as well. The theater reminded me a great deal of the Virginia (also located in Downtown Champaign), with its pillared walls and domed ceilings, and balconies embroidered in intricately carved patterns painted gold. There were circular tables surrounding the stage, each with a black tablecloth and one or two flickering lightbulb candles. 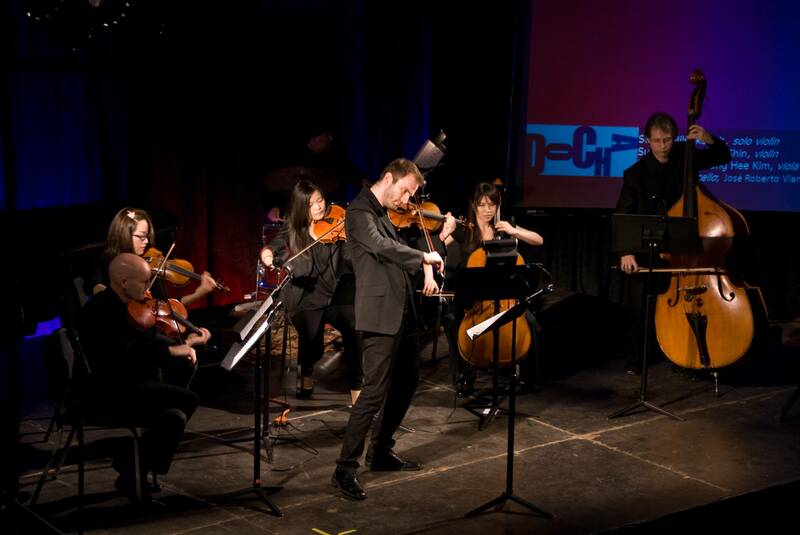 The show itself consisted of three pieces by various composers, each piece performed by a different chamber music ensemble, or small groups of classical musicians in which each performer is assigned to a different part. The program for the evening consisted of George Crumb’s Sonata for Solo cello, Joseph Haydn’s String Quartet Op. 20 No. 5, and Dmitri Shostakovich’s Piano Trio No. 2 in E minor Op. 67. Sonata for Solo Cello by George Crumb was introduced as one of Crumb’s earlier works, and as more “old fashioned” in theory and in technique than his later works. The piece was performed by Dmitry Kouzov who demonstrated an extraordinary degree of technical capability through utilizing a wide array of techniques, including plucked strings, rapid glissando’s, and harsh bowing. The overall feeling I got from the piece was one of great longing, turned to disappointment, then finally to destructive rage. The fragmented phrase structure and vulnerability of the music made it a deeply moving performance. Joseph Haydn’s String Quartet Op 20. No. 5. was performed by the Anasazi Quartet, which consisted of Veronica Pigeon and Amanda Ramey on violin, Kelly Moore on viola, and Samuel Araya on cello. The piece was introduced as having been written during Haydn’s “Sturm and Drang” period, where the composer supposedly explored darker, more serious emotions that resulted in him writing more often in a minor key. The performance, again, was just about flawless. The quartet was clearly very well practiced and comfortable with the music, which, at many points, was often technically challenging and/or deeply exposed. The music itself was far less aggressive than Crumb’s piece, but it did hold a certain sense of menace in how often it fluctuated between major and minor keys. Admittedly, I did grow bored with the piece about halfway through, and I have no reason for this other than pre-19th century classical music is too tame and structured to really spark my interest. The music was certainly pleasant and dreamy, but I didn’t find it terribly emotionally challenging. Dmitri Shostakovich’s Piano Trio No. 2 in E minor Op. 67 concluded the evening. The piece was introduced as one of the most influential piano trio compositions of the twentieth century, and was said to have taken a good deal of influence from Jewish music. The ensemble consisted of Yu-Chi-Tai on piano, Patrycja Likos on cello, and Sibbi Bernhardsson on violin. Their performance was, once again, beautiful, impassioned, and nearly flawless. What I found most impressive was the group’s ability to keep in communication with one another while playing music that demands a great deal of extended techniques, including harmonics and string plucking. Furthermore, I thought the inclusion of piano added an intriguing texture to the piece, one I hadn’t yet experienced in the evening’s previous performances. The music itself experiments with a peculiar blend of emotions, many that occur simultaneously. Overall, I’d say the piece felt tragically humorous. Or maybe it was violently happy? Regardless, it was my favorite performance of the evening.